problems, specifically in a non-profit environment. how these important evaluations go much deeper than basic questionnaires. students, and design enthusiasts, planning is already started for the next WIAD. We would like to let everyone know that we will be moving away from the Blog setting and all of our news will now be found on our main Web site front page (http://si.usf.edu/) and Showcase page (http://si.usf.edu/communication/showcase/). We will also be posting news updates on our new Facebook page. Please make sure to “like” our page if you are on Facebook. For our current students, news will also be found on Blackboard. If any alumni or students have news they would like reported you can E-mail Jessica Voss at jlvoss@usf.edu. 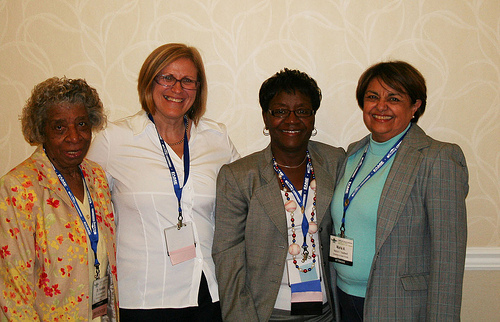 The Florida Association for Media in Education (FAME) is the professional organization at the state level for librarians who work in educational settings. FAME’s President, Cecelia Solomon, is a graduate of the University of South Florida School of Library and Information Science program. 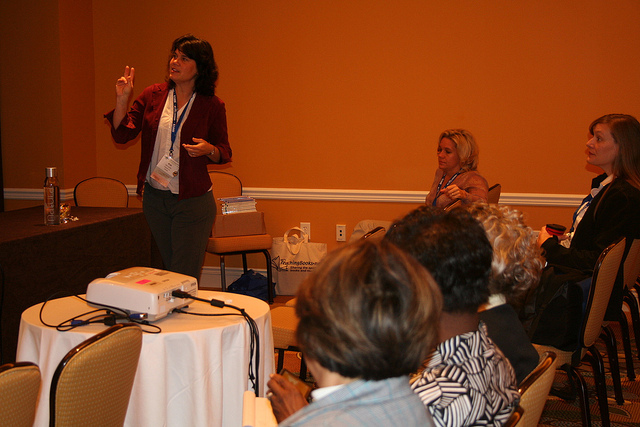 Last week, school media specialists from all regions of Florida congregated once more for their Annual Conference at the Hilton Bonnet Creek Hotel in Orlando. The theme for this year’s conference was Team Work, and many of the sessions and notable speakers referred to this need of working together during the difficult times that libraries and schools are experiencing. Some of the speakers and authors who contributed to the discussion were Margaret Peterson Haddix, Gayle Forman, Caroline Cooney, Toni Buzzeo, M. H. Herlong, Brian Skerry, and many others. The School of Information at the University of South Florida (USF SI) was, as always, present in different venues during the event. 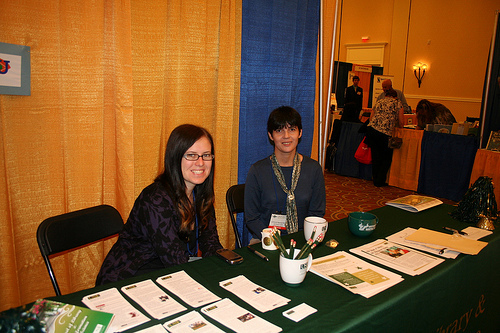 The School’s booth in the Exhibits area attracted not only alumni and well-known faces, but also many professionals interested in the programs provided at USF. TEaM: Technology Education and Mentoring ,a session presented by Professor Diane Austin and LIS students Bill Harris, Nicole Rideout, and Kristine Smith. Game Time: Teamwork and the Community. Presented by Bobbi O’Brien from WUSF. With many people in attendance, interesting sessions, speakers, and the USF SI presence, this year’s FAME Conference was a home run! 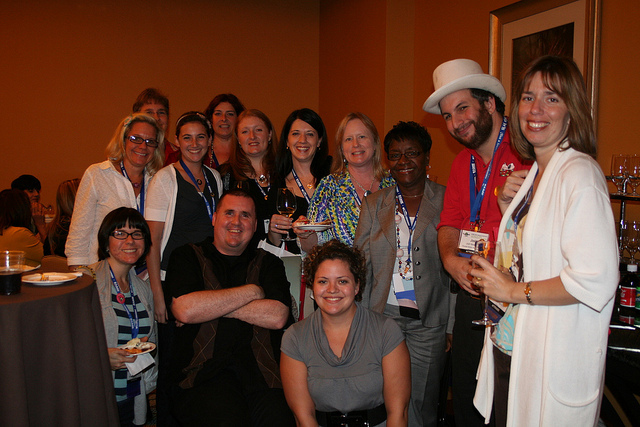 More pictures of FAME 2010 can be found here. The Florida Library Association (FLA)’s semi-annual publication, Florida Libraries, has stepped up to the digital age by moving from print to an online format. The prestigious publication’s fall 2010 issue has just been released in a full-color digital edition. 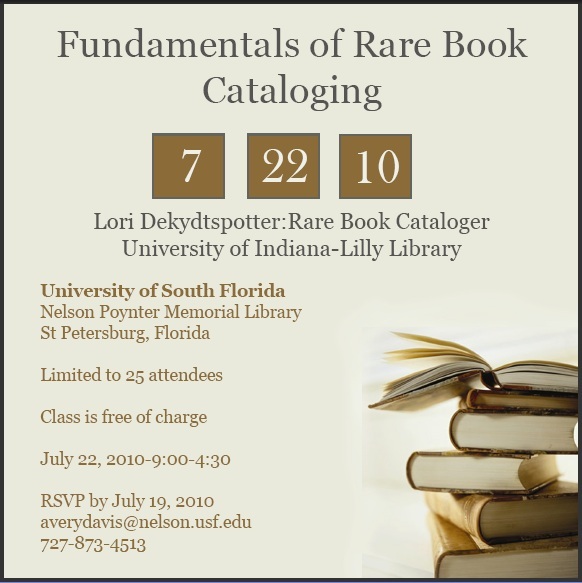 In addition to the new format, this publication features, again, an article by a University of South Florida, School of Library and Information Science’s graduate student. Judiann M. Rakes’ article, titled: “The Power of Partnerships: Opening Children’s Minds Through Collaborative Early Learning Programs,” reports on the collaborative partnership developed between the Volusia County’s Daytona Beach Regional Library and the Early Learning Coalition of Flagler and Volusia (ELCFV.) In times when collaboration is seen as a potential way of maximizing resources, Rakes’ article highlights a successful model that could be followed in other parts of the State. 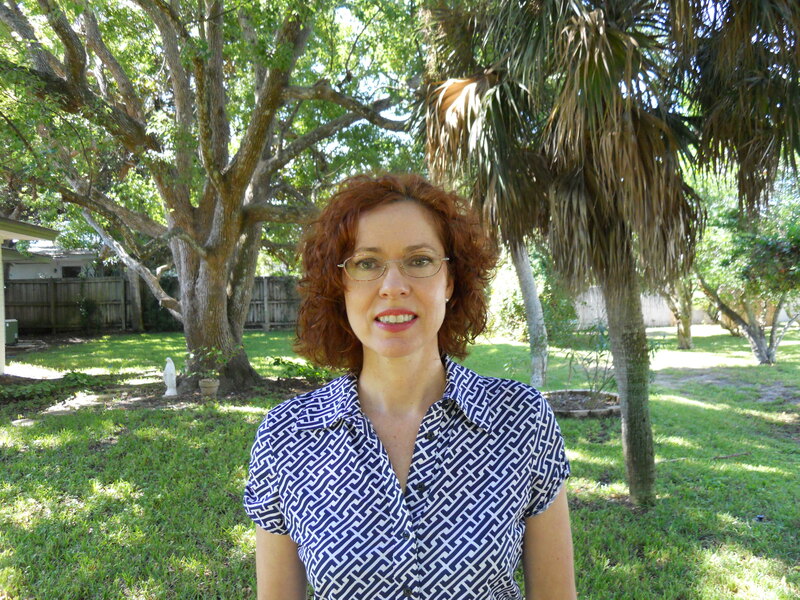 USF SLIS Graduate Student Judiann M. Rakes. It was a pleasure interviewing all the people mentioned in the article. Plus, I hope the article inspires the formation of additional efficient community partnerships,” Rakes said. The fall 2010 edition of Florida Libraries can be accessed by FLA members at their website. 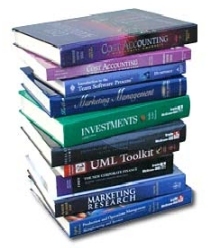 Do you have LIS textbooks that you would like to sell or trade but are not sure how? Do you want to save a little money while helping your fellow students do the same? Well, our SLIS Student Organizations Textbook Swap can help you do just this! Just drop-in on Friday, August 13th between 5 and 9 pm in CIS 2020 to sell… your books and to find the books you need. We hope to see you at the swap! Please feel free to e-mail slisstudentorgs@usf.edu with any questions. Dr. JungWon Yoon´s article “Utilizing Quantitative Users’ Reactions to Represent Affective Meanings of an Image” has just been published in the Journal of the American Society for Information Science and Technology´s July issue. 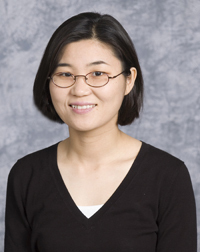 Dr. Yoon has been part of USF SLIS faculty since 2006, where she teaches Organization of Information, Indexing and Abstracting, Digital Libraries, and Visualization of Information. Her research interests concentrate in the areas of image representation and retrieval, user behaviors with image documents, and information visualization, among others. The Journal, commonly referred to as JASIST, is the main publication of the American Society for Information Science and Technology (ASIST) and it is published online in the Wiley InterScience site.